Then wine farms, mountains and magic right on your doorstep. 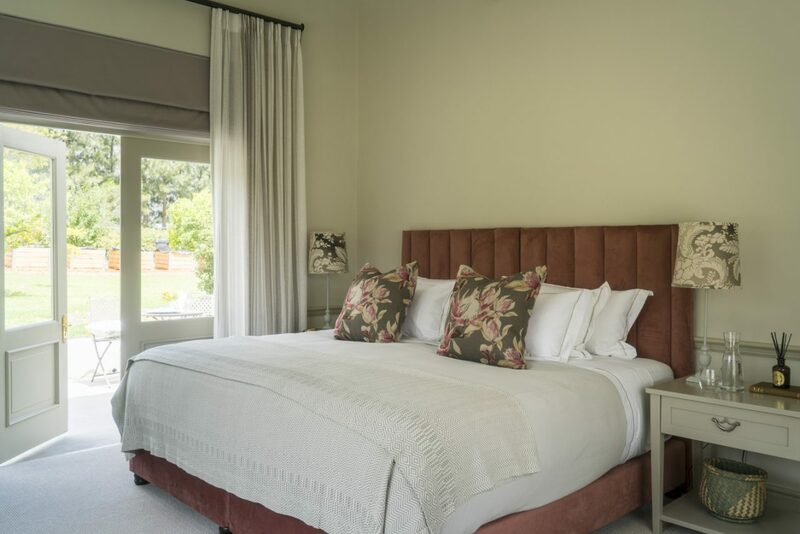 Cape Vue Country House is a beautifully appointed guest house, situated on a farm just 600m from the bustling village of Franschhoek. 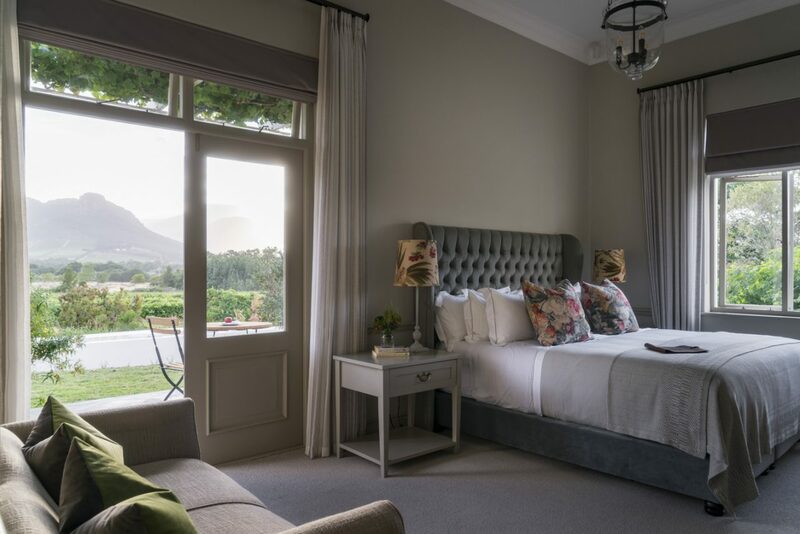 Surrounded by breath-taking mountain vistas, this glorious accommodation venue is the ultimate spot to get away from it all, while still being close to everything the centre of Franschhoek has to offer. We pride ourselves on excellent service and luxurious accommodation in beautifully decorated spaces. 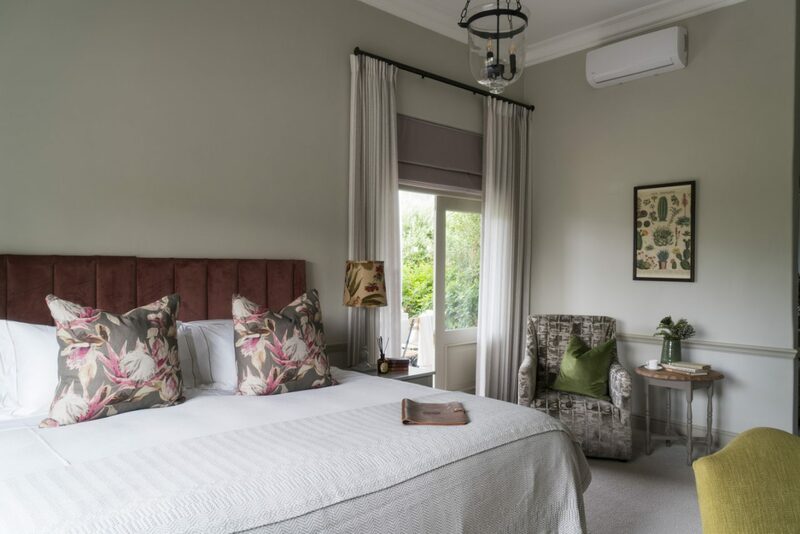 Each of our six rooms is beautifully decorated with opulent finishes and fixtures, percale linen, soft carpets underfoot, air conditioning and underfloor heating. 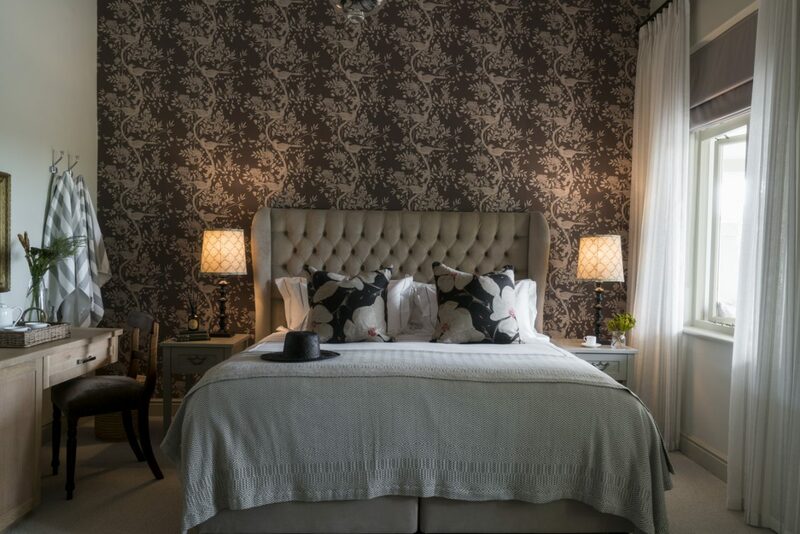 Interior Designers Debra Parkington and Leasa Mensing drew inspiration from the magnificent natural surrounds blending colours and motifs prominent in the Cape Floral Kingdom and the majestic mountain surrounds. Enjoy our complimentary breakfast each morning of your stay, French style with an African twist, and then explore the area or unwind beside our pool on sunny days or in our cosy lounge on cooler ones. All our rooms come with great amenities and services. The following are just a few of the main amenities included by default with our rooms. Join us on the veranda or in the dining room for a delicious complimentary breakfast daily. Locally sourced Franschhoek trout enhances the many carefully prepared Benedict options while tasty onion marmalade and local brie complement a classic rolled omelette. If you’re after real South African flavour, sample one of our spicy Chakalaka options. Here are a few of our recommendations. Franschhoek, ‘French Corner’ in Afrikaans, lies at the head of a steep-sided valley in the Cape winelands. It has become the gourmet capital of South Africa, with great wines, world-class restaurants and lovely hotels all nestled amongst the mountains in this picturesque natural setting. Ten of the town’s thirty-one restaurants are regular award ­winners, while many of its forty winemakers are similarly lauded. The hardest thing you’ll have to do while you’re here is narrow down your list of which spots to visit. The quaint main street is lined with boutique shops and galleries displaying artworks by some of South Africa’s most revered artists, as well as showcasing the who’s-who of the up-and-comers. If history is your thing, there’s plenty of that here, too, with the Huguenot Memorial Museum a must-visit to discover the origins of the area’s strong French heritage and the first South African Perfume Museum offering a truly unique experience. My wife and I stayed one night at the Cape Vue. Big mistake! We should have stayed 2 or 3. 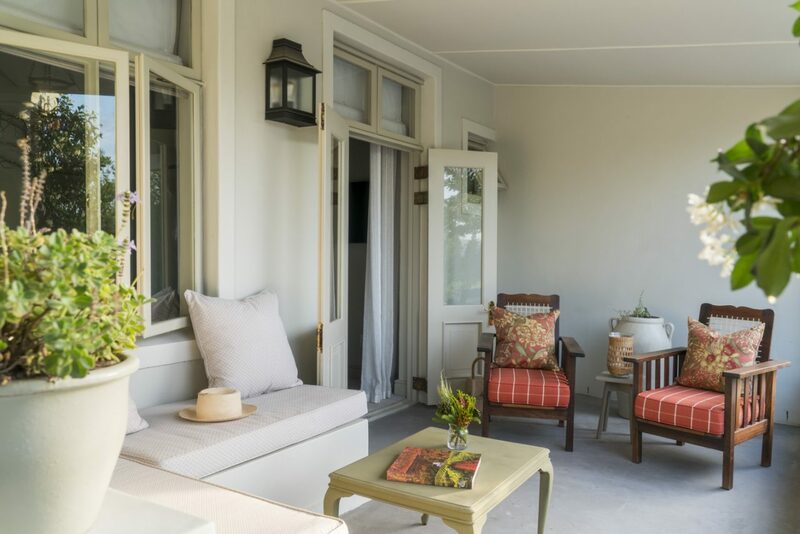 The Cape Vue Country House is beautiful and very charming. We loved it at first sight. The owners Sue and Basil are wonderful. Very friendly and helpful. We felt like members of the family. There are 6 spacious and very stylish rooms. If you go to Franschhoek, don’t look any further! The new Cape Vue is a stunning place in Franschhoek. Sue and Basil and the whole Team around Dino welcome you in a warm atmosphere with great hospitality. The rooms are quiet and luxurious. In the Lounge and the garden you can relax perfectly. You have really a great vue surrounded by nature and you can walk in the centre of the “Foodies-Village” of Franschhoek. 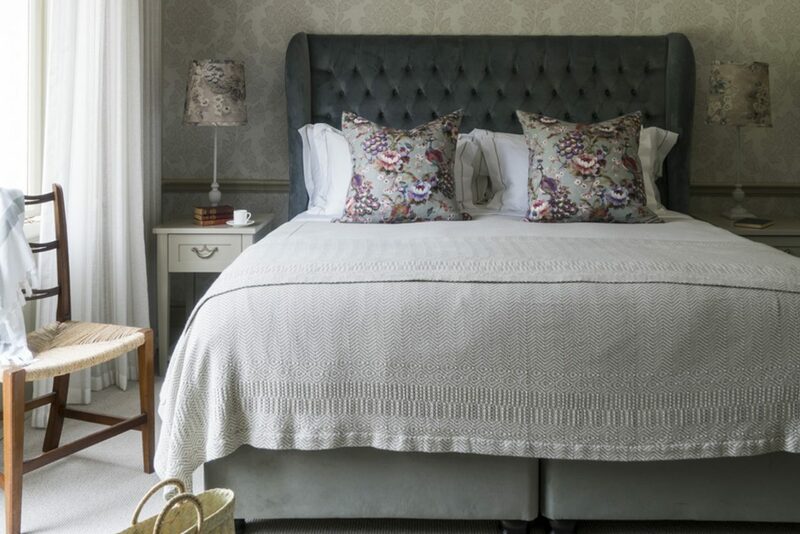 Interested in starting or ending your stay at our sister V&A penthouse?